If you happen to be a leftist or someone who for some crazy reason thinks that the government is the best hands to be in during an emergency situation, here’s a story that will absolutely change your mind. 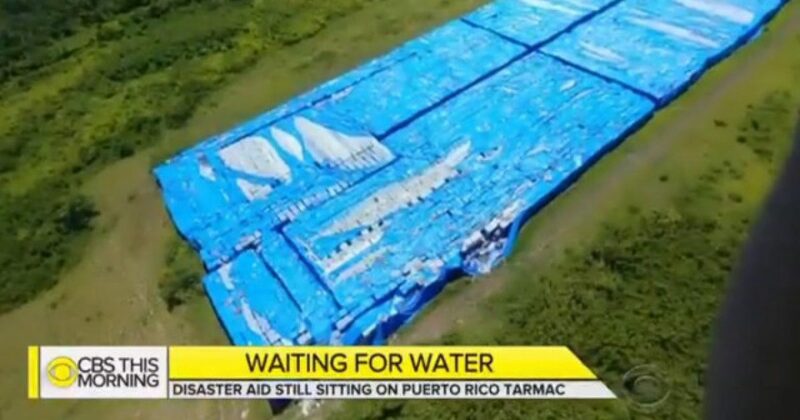 Right now, there are over one million bottles of water sitting on an airport in Puerto Rick that have been there since last year. The bottles were sent by FEMA to aid victims in the area of Hurricane Maria. Now the water is presumed unsafe to drink. Talk about a waste. If you’re an American taxpayer who had funds deducted from your paycheck that went to help these people, you should be very angry. Abdiel Santana, a photographer who works for the Puerto Rico police, said that he first saw the water in October or November 2017. There are, apparently, at least hundreds of thousands, and perhaps millions, of water bottles sitting at an airport in Ceiba, Puerto Rico. Hurricane Maria had hit the island last September. On Tuesday, Santana posted pictures of the water bottles on his Facebook page, noting that it was still on the tarmac a year later. CBS News correspondent David Begnaud reported that the Federal Emergency Management Agency (FEMA) had confirmed to him that it had delivered those specific water bottles to Puerto Rico last year. Once delivered, the water bottles were reportedly turned over to the U.S. General Services Administration in Puerto Rico. It is still unclear what happened next and why the water bottles were never moved or distributed. It’s clear that somewhere, a breakdown occurred and someone’s government is the likely culprit behind the whole screw up. Perhaps we have different definitions of the term “success,” because it seems that allowing a million bottles of water to just sit there at a time when people needed them kind of feels like the opposite of success. And yet, people want government controlled health care. Crazy. VIDEO: Son Who Lost Mother in 9/11 Attacks Destroys Democrats For Using Victims as ‘Props.’ Here’s What He Had to Say.